An EBF Novice Fillies' Stakes over 5f 20y on standard going. Eight two-year-olds take part, a couple with one race under their belts. Mark Johnston has been in cracking form this Flat season and his two-year-olds have been making the headlines. Accladora is a daughter of Acclamation out of a debut-winning mare, who raced at Group 1 level, although last. This bay filly cost 20,000EUR when purchased at the yearling sales by the trainer. She isn't as well owned as the better Johnston two-year-olds which have sparkled this term. I would take a watching brief. Rajar is trained by Richard Hannon, who has been going well with his two-year-olds. They had a nice debut winner at Leicester, yesterday. This daughter of Archipenko is a home bred for Robin Blunt. A wide draw is a negative and not the easiest horse to assess. 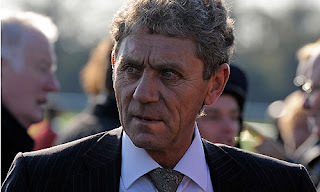 Keith Dalgleish is a trainer to respect and Simmy's Temple showed ability when a fast-finishing runner-up to The Last Lion in the Brocklesby. Kodi Da Capo is a daughter of Kodiac out of a winning mare and cost £26,000 at the yearling sales. The stable can go well with debutantes and a horse to consider if well backed. Interesting that Tom Dascombe sent a couple of horses to start their juvenile careers at Saint Cloud, France, running over four-and-a-half furlongs. Imdancingwithurwife was quite fancied in the betting and prominent until tiring in the closing stages to finish tenth of fifteen. This daughter of Sir Prancealot cost 32,000GNS at the yearling sales and related to Langavat & very talented Euphrasia who was sold at six for 550,000GNS after competing at Group 1 level and official rating of 110. The mare was Listed placed. Well drawn in stall one. If priced 13/2 & less sp this filly has respectable win and place claims. David Evans has been firing his horses out of cannons this season with a ferocious appetite for multiple runners in races. He was a little reserved in this contest with Log Off and the more fancied Mesmeric Moment who showed a touch of promise when finishing with verve when fourth behind the impressive Chupalla, trained by the man of the moment Mark Johnston. To be fair, you would have never believed Chupalla is a filly, she made the opposition look physically inferior and a brute of a girl. Mesmeric Moment is a daughter of Showcasing out of a sturdy mare who won seven times owned, similarly, by Mark Benton, a home bred. This February foal had a stiff task on debut at Kempton because it looks a pretty hot race. The winner is definitely going to Royal Ascot and the second, Stormy Clouds, won a shade cosily next start. The third horse Rapacity Alexander is trained by Evans and was fancied in the betting. Connections were very hopeful of a big run that day and they were unlucky to contest a strong maiden. That, in its way, boosts the form of Mesmeric Moment. She has ran on well, although still a few lengths off the leaders. That initial experience is valuable and a low draw could see a bold show. If priced 13/2 and less, has fair each way claims. Dominic Ffrench Davis is an under rated trainer, probably because he has a relatively small string and that comment is especially congruent with his juveniles. However, he has done well with a couple of fair sorts over the last few years. Readers may remember Manson winning last season and no slouch with an official rating of 85. Jelly Monger was a surprise package at two when winning on debut at odds of 66/1 at Salisbury, then holding her ground at Group class. Hi Milady is a daughter of Sir Prancealot out of a poor mare. This Irish bred filly was purchased by the trainer at the yearling sales for 30,000GNS. She is related to Lehab & Bayleyf. It is difficult to assess Ffrench Davis juveniles but stranger things have happened. A wide draw is a negative. Roy's Boy went to the yearling sales but wasn't sold for £3,800. Kristin Stubbs doesn't have a great deal of juveniles in her stable but this yard knows the time of day. In general, their two-year-olds are better on their second start. Log Off is best watched. Conclusion: As far as stable form goes Accladora and Rajar should be respected although both don't look the best bred types and I would wait for the betting to settle before backing. It could be the case they are weak in the market which would be a negative. Kodi Da Capo is worth noting in the betting and if seriously backed would bring more confidence. Hi Milady, Roy's Boy & Log Off are best watched. The first mentioned could have a chance if available at huge odds although a wide draw is hard work. The two major hopes look to be the race fit Mesmeric Moment and Imdancingwithurwife. The latter would need to be priced 13/2 & less for me to hold any hope. If weak best watched. However, if in that betting guide she has sound each way claims. Mesmeric Moment is interesting. A decent draw, experience, and from a race that looks above average, even for those placed let alone the impressive winner. David Evans does well with his two-year-olds and especially so second start. She ran on well and looks a fair juvenile physically and straightforward in run style. If improving from that first start, must have respectable each way claims.